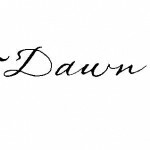 It is friday, time for the Five Minute Challenge by Lisa Jo Baker. FMF is a challenge to join a community of word lovers to write for 5 minutes straight w/no editing on the same word. This week it is JOY…and all I could think of is the joy on my daughter’s face when she eats donuts. Here goes! Joy is an elusive emotion that is also somewhat deceiving. There are times when I can feel the very tendrils of joy wrap around my heart and then in a moment it is gone. This is not true joy. God’s Word says, The joy of the Lord of is my strength. ( psalm 28:7) I can’t say that I have ever considered joy to be my strength, as much as I had considered it an emotion that I’d like to have a bit more often. In retrospect, the fleeting happiness that I thought JOY encompassed, was a mirror or a vague misconception of what JOY really is. Joy is more than a word or an action or a moment of sheer happiness. Joy is a state of being. It bubbles out of your soul when you hear a child’s laughter or a squeal of delight. It is that radiating emotion deep down that starts at your toes and bursts up inside of you till you can no longer contain it. Joy is a reflection of a cherished memory, the ones that you can hold on to when the life has been extinguished and the vessel is no longer there. Joy is a remembering of the moment that your daughter’s smile reached her eyes and your heart, or the day your beloved held your hand and whispered his love. Joy is the 1st taste ‘that’ recipe which you loved as a child and then realize that the memory of the sweetness, not the actual food, is what is far too precious to forget. Joy is a promise of what is coming; something to grab with both hands and believe is possible. It is hope intertwined with grace with an estimated outcome. Joy is a gift that comes from the Presence of the Lord. It is a truth that never lacks or depletes because the source is all-consuming, all-powerful, and absolute. Joy is more than a word, an emotion, or a moment. It is a life lived in abandon to love’s call on our hearts. It is a state of being that overtakes the individual as an extension of God’s mercy toward each of us, for we are the hands and the feet of Jesus… we are the expression of His JOY . As I write this I think of my daughter who thinks joy is all about 3 things..Peace. Love. And Donuts. 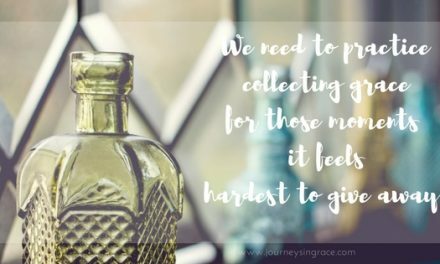 Shortly after my dear grandmother went home, we began collecting her recipes to make and enjoy. She loved to feed her family. Even though, to me, they don’t always taste as good as the special gifts she made, the memory we made together and the memories my children now have of a heritage passed down brings a measure of JOY into my day and eases the pain missing her has feathered upon my heart. 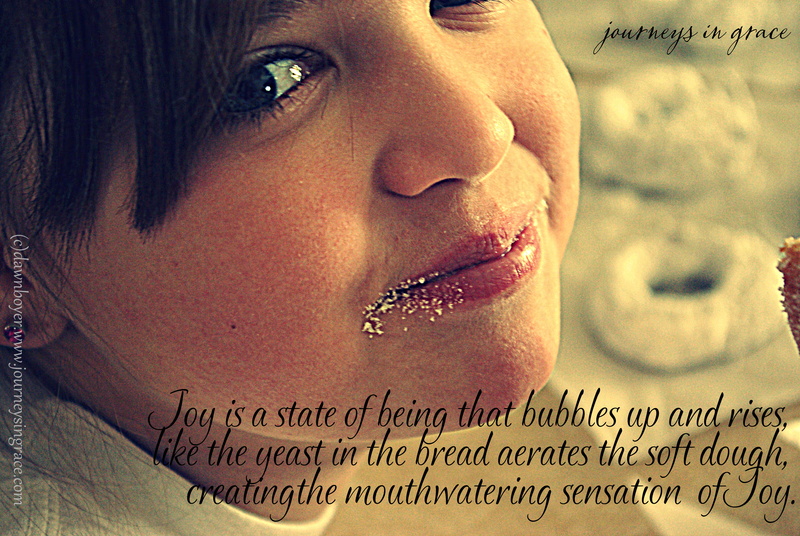 Joy is a state of being that bubbles up and rises within you, like the yeast in the bread aerates the soft dough and creates a mouthwatering sensation of JOY! 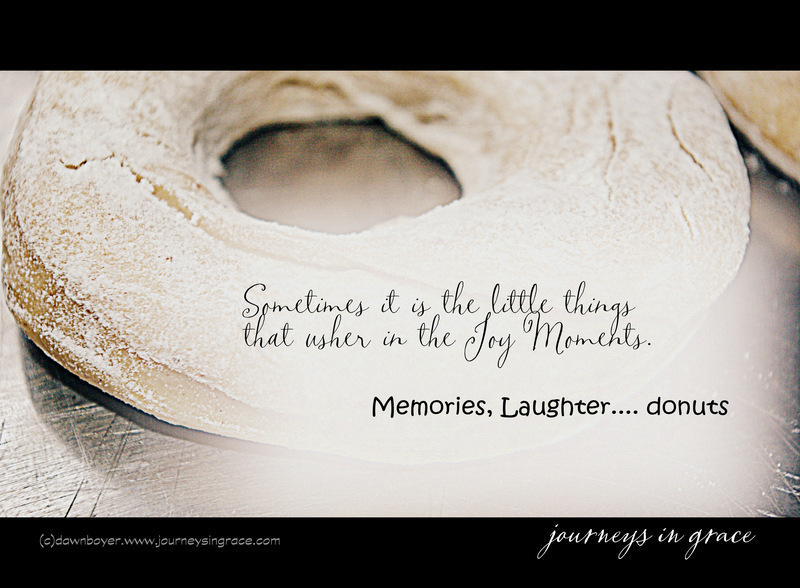 Praying you experience the sweet joy that only memories, laughter…and donuts.. brings to your day! 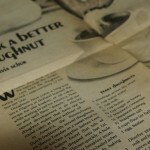 A gift for you: My grandmother’s donut recipe, just as she made it to share for a little bit of Joy in your day! Dissolve yeast in warm water. Heat milk and butter until warm; add sugar, spices and salt. Stir into yeast mixture. Add 2 cups flour; beat until smooth. Add egg and 1 ½ c. more flour, then add remaining flour if necessary; beat to make a soft dough. Knead on a floured board until satiny and elastic. Place dough in a greased bowl; turn to coat all sides. Cover and let rise in a warm place until doubled in bulk, about 1 hour. Punch down, let rest 10 min. (or refrigerate overnight) Roll out ½” thick. Cut with floured 3” doughnut cutter, or use a biscuit cutter and cut holes from center with a floured cordial glass or a large thimble. 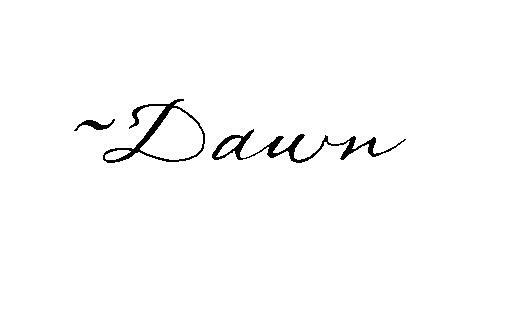 Let rise about 20 min. Heat 3” oil in a heavy pan to 375 degrees; fry several at a time, 2-3 in, turning to brown both sides. Drain on paper towels. Serve plain or shake in a paper bag with sugar and cinnamon, confectioners’ sugar or brown sugar. Makes about 18. Fry ‘holes’ for extra snacks. NextWhat if…. you had faith to move mountains? Have Faith, Believe, and Pray! I loved this thought that you shared with us. I chose joy as my word for 2014 and this is my goal. I want to live a life walking in God’s love, and sharing God’s love with my family and others that God places in my life. I want to cherish these days with my husband and family because I know they pass very quickly. Thank you for sharing you heart. I am stopping by from Five Minute Friday! I hope you have a lovely weekend. I am so glad you stopped by. I agree with you that we need to cherish every second, but sometimes I don’t always connect my heart and my head well and I forget. Praying that as you continue to bask in finding Joy you will be rewarded in ways you have never imagined with the fullness of His presence. You nailed it when you said, “Joy is more than a word, an emotion, or a moment.” Joy is truly the presence of God in our day to day lives. Long after the donut has let my lips for my hips, and the hug from my child has turned into a tiff with their sibling – I still have the continued presence of God! I did a word study on joy last year and it was such a blessing to me! God’s Word is full of references to joy. Thanks for your reflections on joy! Thanks for the encouragement with the Word, Jen. I love that you took time to share and remind us that Joy is linked to both thanksgiving and His presence! P.S. In God’s Word, joy is often linked with thanksgiving!